What is happening in your body during an adjustment at Chiropractic First? 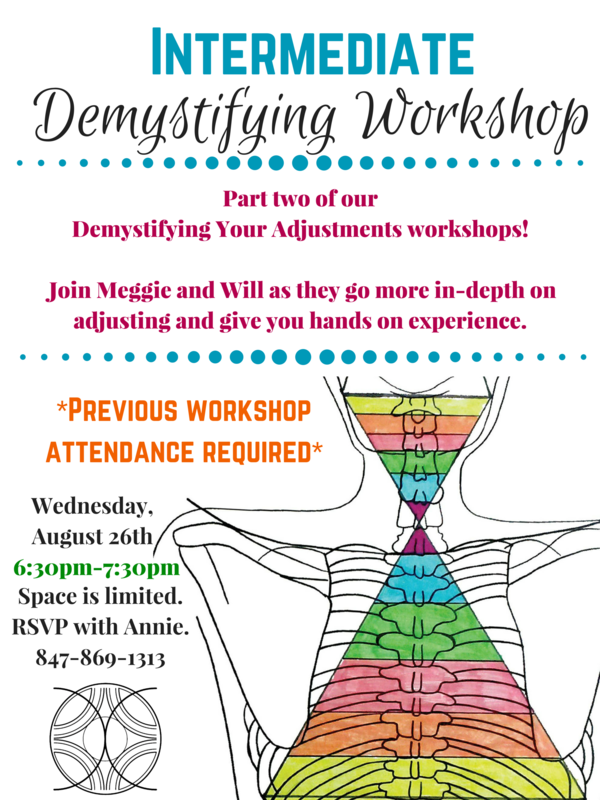 Join Dr. Meggie Smith and Dr. Will Vogds to learn more! 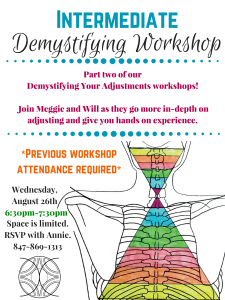 There will be a hands-on demonstration to learn how to feel some of what the doctors feel for when they are adjusting you. Wednesday, August 26th 6:30pm -7:30pm Free! Please RSVP, spaces are limited! I would like to attend the session on May 14 on adjustments at 6:30. I would also like to reschedule my appointment and check up on that day to Thursday, 5/15 at 1pm. Please advise if the Thursday date and time will work for you. Jeanne Minorini ( 312-912-8149). I’d like to attend the workshop on Wednesday night. Hope to be there. A very tough time for me all the way around. So, I will make every effort to be there. Have recommended you to several people, And, on my LinkedIn profile, your business is one I recommend. Be well & happy! Is there a cost to this mini seminar? There is no cost for the workshop! But please do let us know if you will be able to come. Space is limited and filling up fast! Thank you for recommending us to your friends. They are also welcome to join you at the workshop, if they would like to get a sense of what we do before they come in for care.